The following pics show a M73 one time with and one time without shield. Even the camel is different in detail. I can't remember where I got this pic from, thats why I post it here to find a answer. Help welcome! I can tell you, Master Caster. The right picture is defenetly by Mr. Tubb himself because of its grey background and the lightning from the left side. I can say that clearly because I collected once photographs from him because of exactly that reason. A look inside my folder confirmes that. The left one seems to be a ebay-picture. The little camera icon at the right bottom was used by that company some time ago . . . 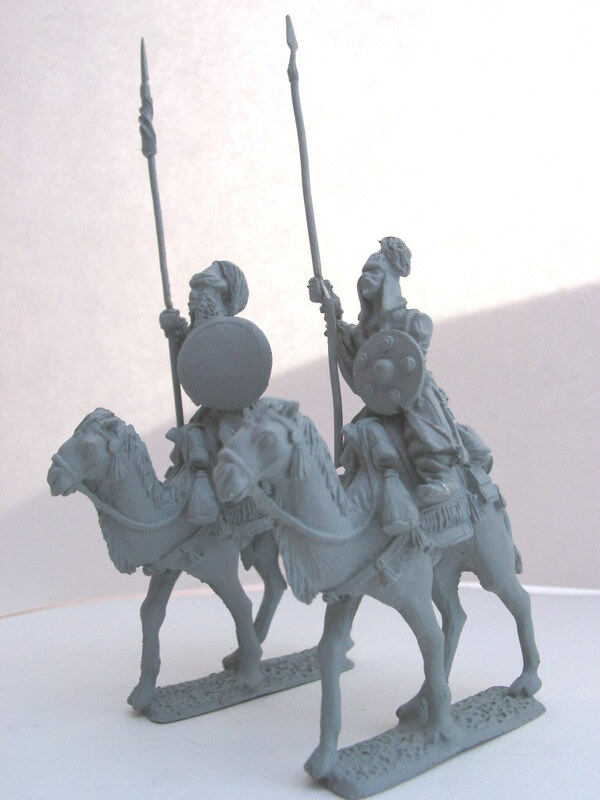 Thanks Master Turambar, CT I know, and ebay can be also, but does someone kow why the guy doesn't have a shield and the camel is different aswell? I will have to check more thoroughly tomorrow. I have two different conversions of that rider in my "conversions-collection". One of them has a completely different shield (that obviously was attached) than the original figure. Master Hsf62, where do you think is the difference in the camels? Start with the hair on the neck of the camel. On the first pic it looks like the hair is going to the right side of the camel, not like on the second pic from CT where it goes to the left side of the camel. The (Quaste) decoration on the bridle aswell as on the back side of the camel is missing in the first pic. There is no blanket on the saddle rolled up in front of the rider. The frayed part on the saddle blanket is a lot shorter in the first pic, therefor the flat part underneath it is longer. Thats all I can see so far. Maybe there is more? I think the differences are significant and I don't think it is a conversion. What do you think? One more thing is the tail. In the first pic it's more to the back and not attached to the hin leg like it is with the cast I have. A sharp look, Master Caster. Quiete obviously the "ebay-picture" in a much clearer look. 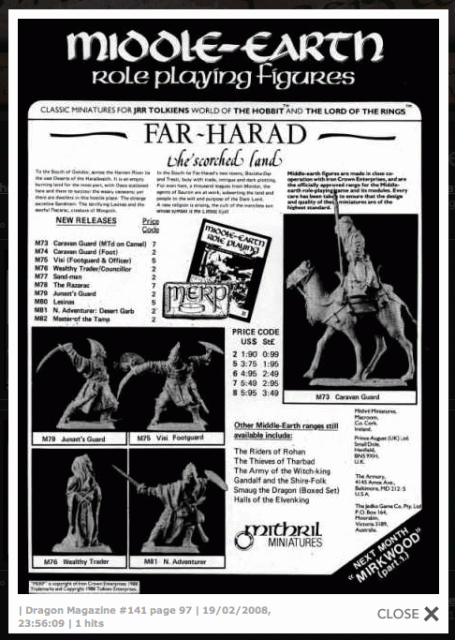 The bunch of figures of "Far Harad". You see, that the shield is fixed at the figure, as it is on my edition of that M73. It is NOT separated. The last picture shows the old advertisment sheet from the irish company. Interesting to see, that the shield is missing!!!!! It is also more than possible, that the source of the "ebay-picture" is that old advertisment photo . . . interesting that is. Indeed it is the same pic. 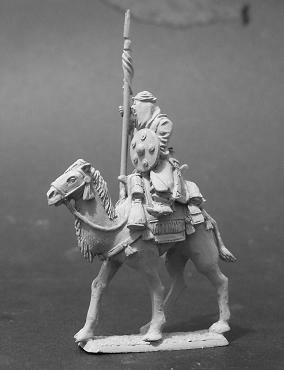 Rider without shield and with the wrong speer and the camel missing all the above mentioned bits. Hmm.... Maybe it was the first Master figure which was changed after the pic was taken to suit casting???? Otherwise there where two different camels made to start of with. I just can confirm Master Turambar's research about this matter. I just found those two conversions in my collection. The shafts and length of the lances are far more better than with the original, I think. 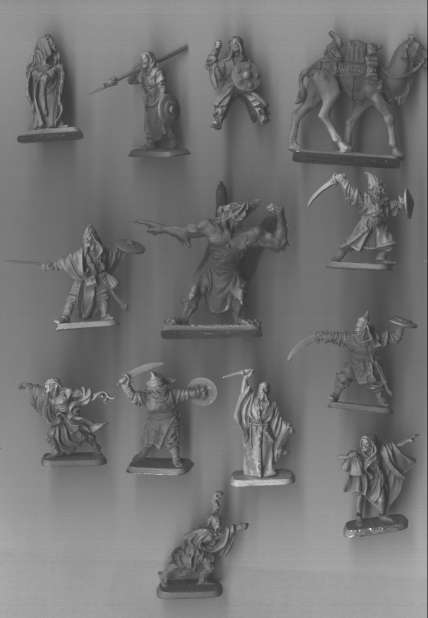 This picture could have been found in the "Mathom House of Michael Delving"
Sorry, but I just wanted to prove what I said about the "camel rider conversions" I mentioned before. I thought that the one on the left with the different shield was an answer to your question. It is not.